For the Greek singer, see Sakis Rouvas. 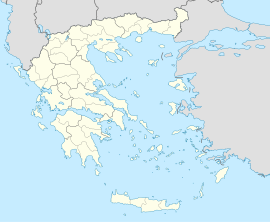 Rouvas (Greek: Ρούβας) is a former municipality in the Heraklion regional unit, Crete, Greece. Since the 2011 local government reform it is part of the municipality Gortyn, of which it is a municipal unit. The municipal unit has an area of 62.725 km2 (24.218 sq mi). Population 1,821 (2011). The seat of the municipality was in Gergeri.